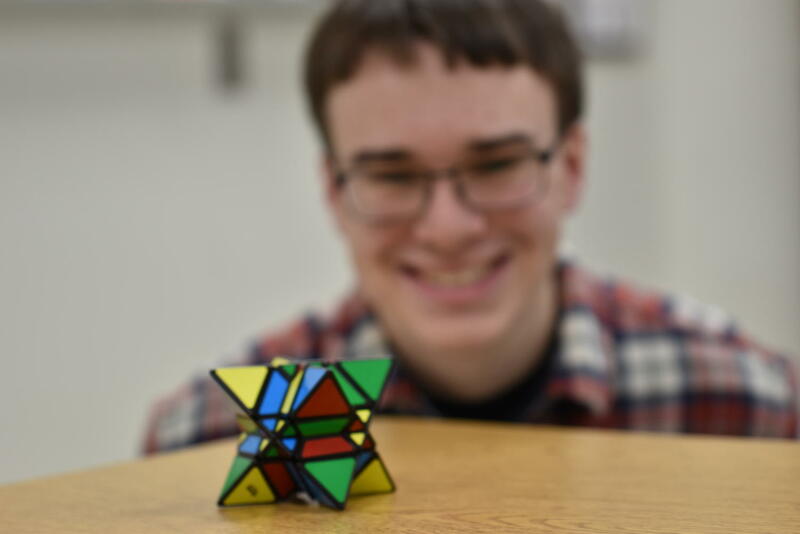 Senior James Marjamaa builds, solves cube puzzles. 25 seconds, that is all that it takes for James Marjamaa, senior, to solve a Rubik’s Cube. This combination puzzle which was invented in 1947 by Ernő Rubik became a hobby of Marjamaa’s that he coincidentally picked up. There are even competitions where people can compete to solve the Cubes the fastest and right now the record is set by Du Yesheng of 3.47 seconds. “One day at I picked on up at my cousin’s house and became frustrated. I wanted to badly to complete it so I took it home and worked until I solved it,” said Marjamaa. After taking this Rubik’s Cube home Marjamaa became hooked. He said that ever since this day his freshman year he has been inspired to not only keep solving different cubes, but also to design some of his own. “I take a regular Rubik’s Cube and modify it, but I also have used a 3D printer to create a few of them,” said Marjamaa. This popular toy of the 80’s is still practiced today and many speedcubers such as Marjamaa collect many puzzles of different difficulties. Marjamaa said that he has about 45 of them so far. He wants to continue to complete more and more Rubik’s Cubes of higher difficulties. “I enjoy the challenge of trying to solve harder and harder cubes,” said Marjamaa. Marjamaa said that his strategy of solving these cubes is very complicated. He practices everyday, but only when he has free time, for he has a very busy schedule and is a hard worker at school. “James is a great student, hard working, and very sharp,” said CG Coulson, Marjamaa’s Principles of Engineering teacher. While Marjamaa says that he wants to do research and physics as a future career he also has big goals involving his Rubik’s Cubes. “I would like to create a puzzle that is mass produced. I have a good idea, but I am struggling to make it,” said Marjamaa.